The American Journalism Historians Association invites nominations for two awards honoring significant service to the study and understanding of media history. 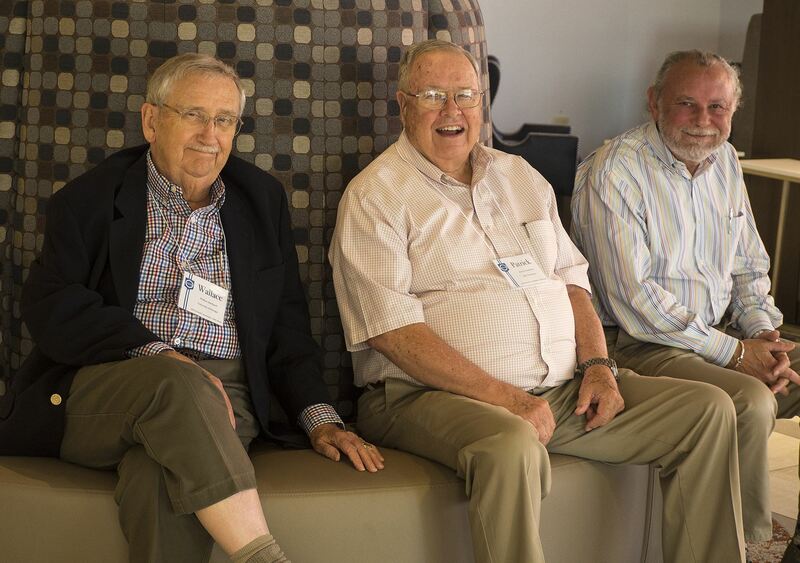 The Sidney Kobre Award for Lifetime Achievement in Journalism History is the organization's highest honor. The Kobre Award recognizes individuals with an exemplary record of sustained achievement through teaching, research, professional activities, or other contributions to the field of journalism history. Award winners need not be members of the AJHA. Nominations for the award are solicited annually, but the award need not be given every year. Those making nominations should present, at minimum, a cover letter that explains the nominee's contributions to the field and a vita or brief biography of the nominee. Supporting letters for the nomination are welcome and encouraged. For a list of past winners, see https://ajha.wildapricot.org/kobre. The Distinguished Service to Journalism History Award recognizes contributions by an individual outside our discipline who has made an extraordinary effort to further significantly our understanding of, or our ability to explore, media history. Nominations are solicited annually, but the award is given only in exceptional situations. Thus, it is not awarded every year. Those making nominations for the award should present, at minimum, a cover letter that explains the nominee's contributions to the field and a vita or brief biography of the nominee. Supporting letters for the nomination are welcome and encouraged. Deadline: The deadline for submitting nominating materials for both awards is May 15, 2019. Submissions: Electronic submissions are preferred via email to Tom Mascaro, Professor, Bowling Green State University, mascaro@bgsu.edu. Alternatively, postal submissions may be sent to the following address: Tom Mascaro, AJHA Service Awards Chair, 33905 LaMoyne St., Livonia, MI 48154. The deadline has been extended until Monday, Jan. 7, 2019, to submit proposals to the Media & Civil Rights History Symposium. The School of Journalism and Mass Communications of the University of South Carolina in Columbia will host the biennial symposium, scheduled for March 8-9, 2019. The event welcomes scholars from various disciplines and approaches that address the vital relationship between civil rights and public communication from local/national/transnational contexts, perspectives and periods. The symposium will take place in conjunction with the AEJMC Southeast Colloquium. Paper abstracts (up to 500 words) and panel sessions (up to 1,000 words) are being accepted on all aspects of the historical relationship between media and civil rights. Abstracts for papers and research-in-progress must include a title, brief description of the research, and some primary sources. Panel proposals must include a title, brief description of the panel and panelists. For more information, visit http://bit.ly/uofsc-sjmc-mcrhs or contact Dr. Kenneth Campbell, director, Media & Civil Rights History Symposium, at kcampbell@sc.edu. In addition, the call to submit entries for the Farrar Award in Media & Civil Rights History has been extended to Jan. 7. The award recognizes the best journal article or chapter in an edited collection on the historical relationship between the media and civil rights. Submitted articles or chapters should be works of historical scholarship and must have been published in 2017 or 2018. Submissions that address the media and civil rights from a range of local/national/transnational contexts, periods, and perspectives are encouraged. The recipient of the award will receive a plaque and $1,000 and must present the scholarship in a featured address at the Media & Civil Rights History Symposium in March. The new Journalism History podcast launched by Teri Finneman (Kansas), Nick Hirshon (William Paterson) and Will Mari (Northwest) is now live with several episodes available. The team encourages you to incorporate episodes into your spring syllabi as homework assignments for students. We are looking for episode sponsors for our spring semester shows. Cost is $25. Authors can promote their books or universities can promote their programs. Questions? Email Teri at finnemte@gmail.com. 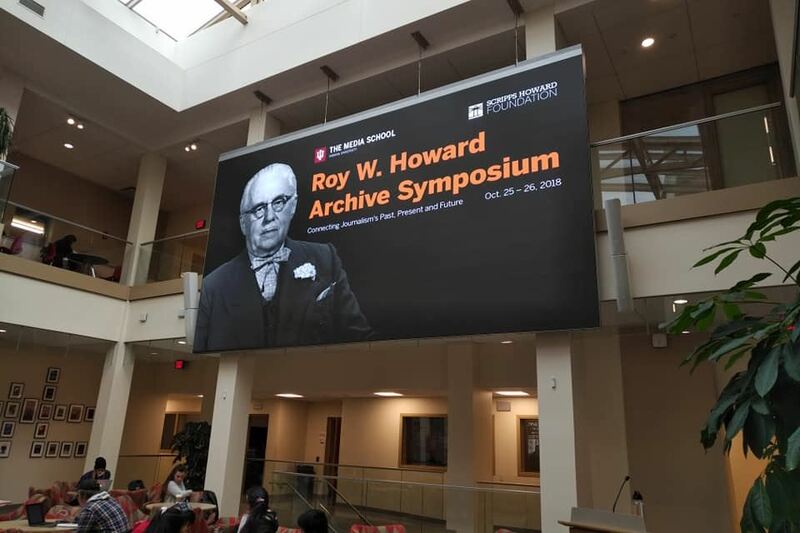 Scholars from around the country and even as far away as Germany came to Indiana University’s Media School in October for a symposium to mark the launch of IU’s new digital Roy W. Howard Archive. Howard was an influential journalist who rose to run the United Press and the Scripps-Howard newspaper chain during the first half of the twentieth century. IU has been home to an extensive collection of his papers since 1983, when his family donated them to the university. Last year, the family and the Scripps Howard Foundation provided funding to make the collection even more accessible. The grant allowed The Media School to hire a team to catalog and digitize more than 14,000 letters, photos, business records and other items in the archive. The materials are now online in a free, searchable archive that covers Howard’s life and career from 1892 to 1960. In the more than three decades before the collection was digitized, a number of historians visited IU to work in the physical archive, and several of those scholars returned to Bloomington to participate in the symposium. They included Gene Allen of Ryerson University, who studies the history of news services such as United Press, and Kirsten Bönker of Bielefeld University in Germany, who used the Howard materials in her studies of Cold War history. The Howard archive contains correspondence between the publisher and numerous prominent figures, including U.S. presidents such as Theodore Roosevelt, FBI Director J. Edgar Hoover, and Philippine President Manuel Quezon. The enhanced searchability of the online archive opens up new horizons for researchers, who can now run keyword searches and discover specific documents in a way that wasn’t possible before. That advantage of digital archives was among the issues discussed by a panel of archivists during the symposium, and attendees also heard from scholars doing preliminary research in the new digital collection. Melony Shemberger from Murray State University (editor of the AJHA Intelligencer), for instance, spoke about her discovery of correspondence from Roy Howard in 1914 discussing a new strategy for getting news of World War I home to readers in the United States. The goal of the Howard family in funding the digitization project was to give Roy Howard’s papers greater visibility. To that end, the archive is available to the public as well as scholars. Journalist and author James Neff opened the symposium with a keynote talk focused on the value of archives for journalists. Neff, deputy managing editor of Philadelphia Media Network, has written five nonfiction books based to varying degrees on archival research. The Center for Media and Journalism Studies at the University of Groningen will host the fourth annual conference on Transnational Journalism History. The conference, which will be June 20 and 21, 2019, is seeking papers that study historical transformations in journalism from a transnational perspective. the transfer of norms, practices and textual conventions from one country/region to another and their consecutive adaptation in national contexts. biographical studies of transnational agents such as journalists or publishers. the transnational coverage of particular news stories. the impact of (emerging) technologies on transnational journalism. different media such as television, radio, newspapers or magazines, and the intersection between them. Abstracts (maximum of 500 words for research-in-progress), full papers (for completed projects) and panel proposals (max. 4 papers; 400 words panel description & 150-word abstract of each paper) should be submitted via journalismconferences@rug.nl by March 1, 2019. (Please note the deadline has been extended from the original call for papers because the conference dates are later than usual). Submissions will be blind reviewed. Organizers are looking for submissions that might also be considered for publication in a new book, the Companion to Transnational Journalism History. The first book from the earlier conferences is presently under review at Syracuse University Press. For those unfamiliar with transnational journalism history, it acknowledges that media and other cultural forms are produced and exchanged across borders. It focuses on the interactions between agents, ideas, innovations, norms and social and cultural practices, and their consecutive incorporation and adaptation into national frameworks. By moving back and forth between the national and transnational level, the connective and dialectic nature of these movements is emphasized. It thus treats the nation as only one phenomenon among a range of others, instead of being the primary frame for analysis. This opens new venues for research because journalism history, which has been institutionally and topically confined primarily to national boundaries. Transnational journalism history critically interrogates national paradigms and provides new ways forward. This year’s conference will take place on June 20-21 at the Centre for Media and Journalism Studies in Groningen, The Netherlands. Conference fee is € 75 (incl. lunches and conference dinner). Keynote speakers will be announced in the next months. Questions may be addressed to Marcel Broersma or Frank Harbers via journalismconferences@rug.nl, Debbie van Tuyll (dvantuyl@augusta.edu) or Mark O’Brien (mark.obrien@dcu.ie). This conference is sponsored by the Centre for Media and Journalism Studies at the University of Groningen, and the journalism and mass communication programs at Dublin City University, Augusta University and Concordia University. Communication, is now accepting submissions for the 2019 conference. This one-day interdisciplinary conference welcomes scholars and graduate students with an interest in journalism or communication history. Innovative research and ideas from all areas of journalism and communication history and from all time periods are welcome. This conference offers participants the chance to explore new ideas, garner feedback on their work, and meet colleagues from around the world interested in journalism and communication history in a welcoming environment. Graduate students are encouraged to apply. When: Saturday, March 9, 2019, 8:30 a.m. to 5 p.m.
propose meetings of any time length during the conference day with up to ten participants. The deadline for submissions is January 5, 2019. Proposals must be submitted via Easy Chair at: https://easychair.org/conferences/?conf=jjchc2019. Meeting Dates: March 9, 2019, 8:30 a.m. – 5 p.m. The American Journalism Historians Association elected a new second vice president and three new board members during its 37th Annual Convention in Salt Lake City, Utah. Dr. Aimee Edmondson of Ohio University will serve as second vice president during 2018-19, beginning a three-year tenure which will culminate in her serving as the organization’s president in 2020-21. AJHA’s new president is Dr. Ross Collins from North Dakota State University, who was initially elected to serve as second vice president in 2016 and served as first vice president from October 2017- October 2018. Dr. Donna Lampkin Stephens from the University of Central Arkansas now serves as first vice president. The new administrative secretary is Dr. Erika Pribanic-Smith from the University of Texas-Arlington, and Dr. Carolyn Edy from Appalachian State University continues as treasurer. Scholars representing universities from across North America were recognized for their work on research papers at the American Journalism Historians Association’s annual convention in Salt Lake City, Utah, earlier this month. The Jean Palmegiano Award for the Outstanding Research Paper on International/Transnational Journalism went to van Tuyll.